Cinemusic: The Ecstasy of Korngold | Warped Factor - Words in the Key of Geek. Chris Morley looks back at the Austrian composer said to have inspired much of John Williams work. 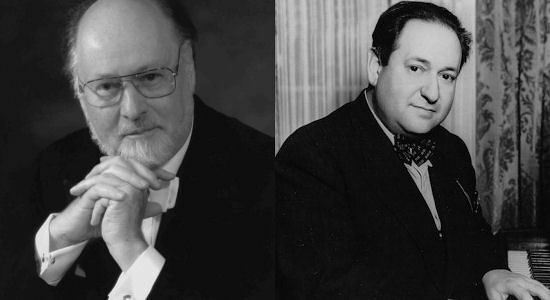 Delving back into the roots of the epic sound driven by such composers as John Williams in the modern age of movie music, it becomes apparent that to gain a better understanding we must step back to the Hollywood of the Thirties - into which heady world stepped one Erich Wolfgang Korngold upon arrival in America fleeing Nazi persecution in his native Austria. Something of a prodigy, his ballet Der Schneeman, or The Snowman, written when he was only eleven, won him attention from Viennese ears & indeed later status as a Professor of Music at the city's Academy. Director Max Reinhardt, another refugee from Austria following the Anschluss, heard something in the music of his fellow displaced creative soul & invited Korngold to score his 1935 adaptation of A Midsummer Night's Dream. That same year, the first stirrings of the adventurous style later aped by Williams, among others, could be said to have been present in Captain Blood (with the titular pirate captain played by one Errol Flynn - credited by George Lucas as an inspiration for the character of Han Solo many years down the line). Perhaps its 1938's The Adventures Of Robin Hood, which reunited Korngold with Flynn & director Michael Curtiz, though, that really stuck in Lucas's mind. After all does the smuggler not have much in common with the outlaw of Sherwood Forest? A tradition that continued as Williams returned to score The Force Awakens! Though Alex Ross, author of The Rest Is Noise, writing in The New Yorker, delivered a warning shot to those who were quick to write off Williams as a copycat. "It has long been fashionable to dismiss Williams as a mere pasticheur, who assembles scores from classical spare parts. Some have gone as far as to call him a plagiarist. A widely viewed YouTube video pairs the “Star Wars” main title with Erich Wolfgang Korngold’s music for “Kings Row,” a 1942 picture starring Ronald Reagan. Indeed, both share a fundamental pattern: a triplet figure, a rising fifth, a stepwise three-note descent. Also Korngoldesque are the glinting dissonances that affirm rather than undermine the diatonic harmony, as if putting floodlights on the chords." Just to confuse/shed a little more light on such matters, both Korngold & Williams make extensive use of the idea of leitmotif, which is, put simply, using a recurring musical phrase to denote a character, place, etc. It's present in The Adventures Of Robin Hood , just as it is in Star Wars - Robin & Luke Skywalker both given heroic themes, with the Sheriff of Nottingham & Darth Vader assigned something more befitting their villainous natures. Our two points of composorly comparison cannot lay claim to having invented the concept, though. Credit there must go to Richard Wagner, the German Romantic composer to whom its popularly attributed. "It's really amazing to think that there is a whole generation of music that was wiped out by the Nazis, that does not exist, at least officially, in our list of, let's call it '20th century music'. This whole era. And with the Hollywood composers, I find it equally fascinating because they were in this mindset of looking to the future. If you look at Korngold, the kinds of pieces he was writing in the 1920s and '30s, they were extremely ahead of their time. And yet when he arrived in Hollywood, the requirement was this big, symphonic music. So, in a sense he was sent back in his development. And yet Hollywood gave him such a fantastic opportunity at the same time. Not just an opportunity to write music, but also to save many of his relatives. And Korngold said, 'I will compose film music until Hitler is gone.'" Which he did! And how Hitler's favourite composer helped in that process will linger for generations, as the LA Times would note. "Wagner kept his leitmotifs in a constant state of flux. It was not theme and variations. It was a grab-bag of material that was constantly evolving, constantly changing. That's how Howard Shore treated all his thematic material in 'Lord of the Rings', and that's largely what Williams does in the 'Star Wars' and 'Indiana Jones' films. You have a prime version of these themes that is then deconstructed and evolved throughout the films — which is wonderful, and has obviously worked for generations." "The refugee composers were carrying on the very thing that they saw every day in the opera houses." Full circle, metaphorically & literally!